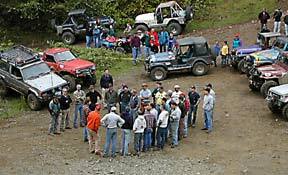 Test your off-road skills in a compteitive event against others in the exciting Pacific Northwest! This two-day TEAM event will allow you and your 4x4 to test your preparedness for the unknown! You and your TEAMmates will be encountering a variety of tasks, not limited to just driving. Over the two-day period you will cover various routes, each with their own challenges. Expect to be required to read a map and use a compass, do TEAM tasks, balance your vehicle, drive a trials section, winch AND anything else thrown at you. The winning TEAM will have the best score over the two-day period. Not sure exactly what you're in for? Check our "Comments" page for first hand wrap-ups and photos, and make sure to read the TTC 2000 Wrap-Up for a good description of several of the tasks. A TEAM shall consist of two vehicles and not more than four people total. That means only two per vehicle. At least one vehicle shall have a working winch. All are to be street legal and licensed in their respective states. ORV stickers will be needed where applicable. All must have road legal liability insurance. Hard tops or roll bars and seat belts are required. Tow points front and rear. Must carry fire extinguisher, shovel, first aid kit, jack AND a spare tire would be helpful. All vehicles will have a Safety Inspection before you will be allowed on the course. NOTE: Size Restrictions: The course is designed around a short wheelbase (76" width 107" long wheelbase). If the size of your rig may cause damage to the trail, you may be routed around. Call if in doubt! Only thirty TEAMS of two vehicles each will be accepted. Mail entry to address on the application form by May 5, 2006, to get discounted registration fee ($60 per vehicle) and reserve your spot. Entries after that date ($75.00 per vehicle) should be brought to the event site and will be accepted if the limit has not been reached. Call (503) 661-5123 and leave a message.